I’ve lost count of the number of times I’ve sat at my desk staring at a blinking cursor, willing the words to come forth, and multiply. Or spent hours writing and rewriting sentences because no matter what I do the wording isn’t quite right. Inspiration can be hard to pin down. Words don’t always come when you need them. If you write regularly – for your blog or website or to produce regular social media content – you’ll know that sometimes the words spill freely onto the page. Oh the joy! But at other times the words and phrases you need evaporate before you can get them on the page or stay locked behind an impenetrable wall. Over the years I’ve developed several habits that help me unlock the right words and break through the wall. These habits have nothing to do with the act of writing itself. They are the building blocks that, whatever type of writer you are, will help you before you even put pen to paper. Heck, they’ll help you even if you never write a word. These habits are all about cultivating a healthy mind where there’s room for your thoughts to take shape and your natural way with words to shine. For the words to flow you need the head space, the room for ideas to grow and take hold. The habits of your life can facilitate or hinder this. The premise is that if you clear all the noise in life from your head there is room for the magic to happen. 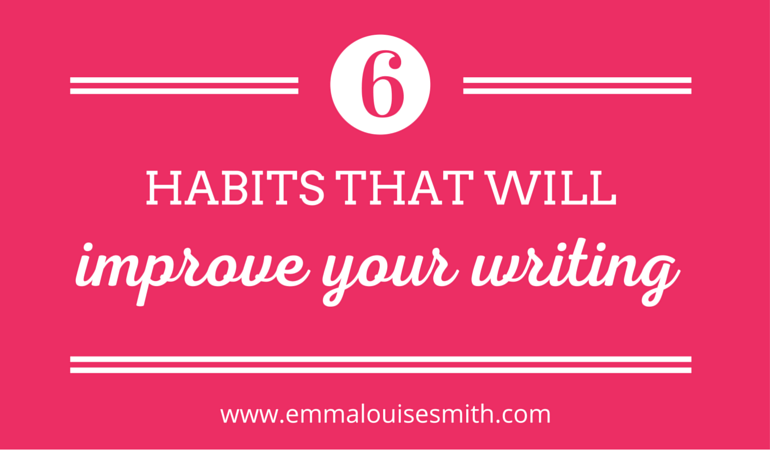 Healthy habits breed writing success. These are habits I aim to practice daily but they also come in handy in the moments you find yourself stuck, watching that blinking cursor while you battle the jumbled of words in your head. You don’t have to do all of them. Maybe pick one and do it every day for a week, or practice it just before you next sit down to write. Maybe they won’t work for you, I’m not making any promises, all I know is that they help me, so try them out. No harm done. Most writers are also avid readers. If you don’t like reading you probably don’t enjoy writing either. I can’t imagine life without reading. Reading feeds me, nurtures me, and takes me on a daily journey of discovery. Through reading you can discover the power of words, get an education, and find another world to escape into. Read every day and your writing will benefit. Massively. Read a chapter from an inspirational book, a classic novel, or an article about something you want to discover. Be curious. Here’s a list to get your started (courtesy of James Altucher, a massive advocate of reading). Every morning I read a chapter from a self-development or business book about self-development. I also read last thing a night. So I can totally switch off and don’t lie awake thinking about work or new ideas, I don’t read anything work related. I’ll pick up a novel I can escape into, giving my brain space to rest, letting my ideas gestate. Everywhere you turn someone is gushing about how meditation has changed their life/increase their wellbeing/is the key to success. I’m afraid I’m going to jump on that bandwagon. Every business guru seems to have the same mantra – that a daily meditation habit is the common denominator shared by the super-successful. Steve Jobs, Oprah Winfrey, James Altucher. I could go on. The fact is it’s true. Meditation helps manage stress, improves focus and reduces anxiety. Research has found that meditation promotes the divergent thinking that allows new ideas to be generated and helps you filter out other mental processes while performing creative tasks like writing. For the last four months I’ve been meditating for 10 minutes (yes, it only has to be 10 minutes) as soon as I wake up. I try to wake up and meditate before my daughter wakes up, while the house is quiet, but it doesn’t always happen. If she wakes up first, I may as well forget it. But it’s happened often enough that it’s become a habit and now I crave it. My mind is running at 100 miles an hour most of the time, and that 10 minutes of connectedness to the moment – to my current mental and physical state, centres me and delivers me to my day in a calmer, and more positive state of mind. As soon as I wake up my mind starts sprinting through the demands of the day and meditating puts the brakes on and reminds me to simply be. Having a better connection to myself means that state of flow is not as hard to reach as if I didn’t practice taking myself there on a daily basis. And it comes in handy whenever you’re feeling stressed or overwhelmed. Stop close your eyes, focus on your breath and let the inner you speak. Another hackneyed piece of advice, but with good reason. We all know the benefits of exercise but I bet you never realised it could also help your writing. It doesn’t have to be full pumping iron in a sweaty gym. Just take a walk. There’s something about the fresh air and the rhythmic movements of my body when I walk that I find hypnotic. Sadly I can’t say the same about running, all I think then is ‘Make it stop’! Maybe it’s connecting with nature – we have miles and miles of woods and fields stretching as far as the eye can see at the end of our road. Whatever it is walking has a similar affect on me as meditation. Sometimes I’ll listen to a podcast or music while I walk. But mostly I just enjoy the silence, take in the sounds of the birds, insects and the wind, and simply connecting to the moment. I know that when I do get out for a walk, when I get my body moving my mental capacity gets an injection of energy. As I’m walking I get ideas for what to write about and then I want to rush home to get them down before they slip away. I’ll admit, my relationship with exercise is a one of feast and famine. I’ve recently started doing a 10 minute exercise routine straight after I meditate, which helps get the blood pumping to my brain right at the start of the day, but I need to build a 20 minute walk into my daily routine. If you’re feeling stuck, sluggish and devoid of inspiration, get yourself out for a walk and your mood will lift, your head will clear, and the idea will start to arrive. For years every time I downloaded an app to my phone I’ve been clicking yes to the ‘turn on notifications’ question. What an idiot. As a result my phone was beeping or flashing up notifications every few minutes. Not good. Constant distractions are the enemy of writing. Writing takes concentration, focus and the space to think. Thanks to the insight of my mentor, Heather Thorkelson, it dawned on me that I didn’t need to put up with this (er, yep!). I was in control, I could turn the damn things off. So now it’s up to me when I check email/Facebook/Twitter/Whats App. I’m not at their mercy. Not only that but I’ve also unsubscribed from all unnecessary email newsletters that fill my inbox, and have switched off notifications from the Facebook pages and groups that aren’t immediately beneficial to me. So I beg you, turn it all off. This one action will immediately benefit your ability to write. Just do it. Despite the fact that we all know that we perform better in every way when we are well-rested, most of us don’t get enough sleep. Sleep for eight hours a night and you will be better at what you do, writing or otherwise. Fact. What is a less well known is that old advice to ‘sleep on it’ really is backed up by science. Researchers have demonstrated the value of a break that involves getting some shut eye adds to creativity and problem solving. Sleeping is proven to help you find a better solution. While I was still in my part-time job and running this business on the side, I was often up late at night working on a piece of writing for a client. I soon learnt that when I found myself battling to make sense of whatever I was writing the best plan of action was to get to bed, get some sleep and come back to it in the morning. Suddenly the words I couldn’t find the night before spilled out onto the page. The key turned in the lock. Sleep feeds both the body and the mind. I don’t know about you but if I’ve got a mental to-do list whirling around in my head I find it harder to concentrate. So I brain dump it all into my bullet journal. Which is basically a fancy to-do list, come journal. At start of each the month I list everything I need to, who would like to get done. Each week I set goals, and every day I write a list of both personal and work to-dos. I am far more productive since I started doing this, and my writing has benefited because my ability to concentrate on the task before me is not compromised by worrying about remembering to pay my credit card bill, or send an invoice to a client. Now that I’m working for myself and can set my own agenda (air pump!) I set a schedule for my day so that as far as possible I keep to a regular routine. Writing daily is part of that routine. But if I’m not organised and I don’t schedule it it in often doesn’t happen. Thank you for reading and commenting Joelle. Much appreciated!